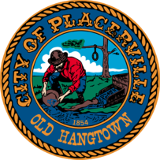 Please note that the majority of properties within the 95667 ZIP code, including many with "Placerville" addresses, are not within the incorporated City limits of Placerville. http://edcapps.edcgov.us/building/DesignCriteria.asp and type in the Parcel number. Zoning and Look Up for Streets within the City. Download our City of Placerville Streets & Address Ranges List . When in doubt, please contact us to verify which agency has jurisdiction over the property before you complete permit paperwork. In addition to using the above download, you can also use the County’s GOTNET parcel inquiry web-based service. The City recently collaborated with the El Dorado County to provide the City’s zoning, land use and topological information on this County service. Other information available through GOTNET is flood zone information, aerial photos, etc.